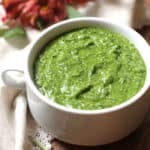 Spinach Walnut Pesto Sauce is a great way to use up extra spinach leaves, and makes an outstanding pesto sauce that you can use in countless ways. The flavor is even better than the vibrant color! 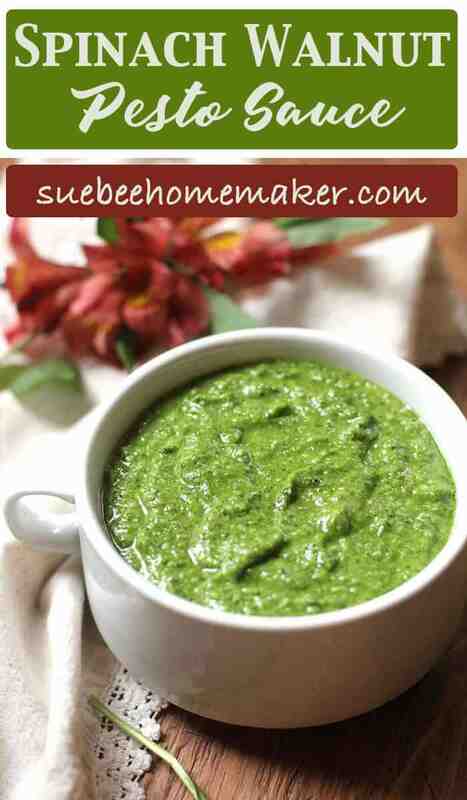 Before the beginning of my blogging days, I would have never considered making pesto sauce. Now that it’s a staple in our home, I can’t think of a better sauce to make and keep in small batches in my freezer. The ingredient list is simple. 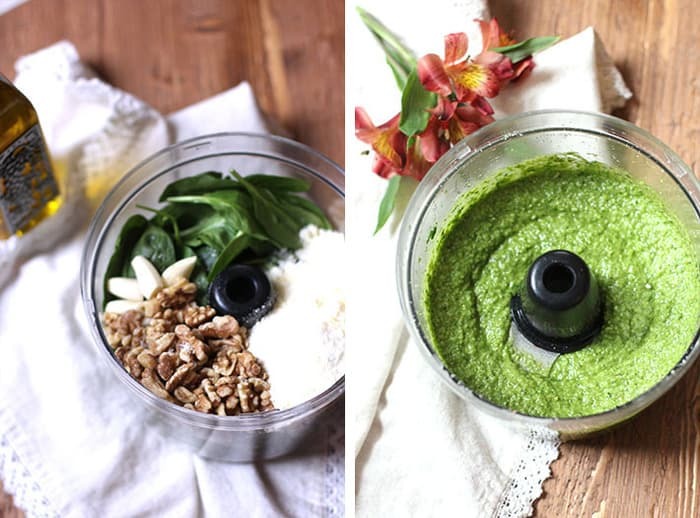 The difference between my Spinach Walnut Pesto Sauce and my original pesto sauce is 1) spinach replaces the basil leaves and 2) walnuts replace the pine nuts. That’s it, and now I’m dreaming up all kinds of other pesto sauces with different combinations. 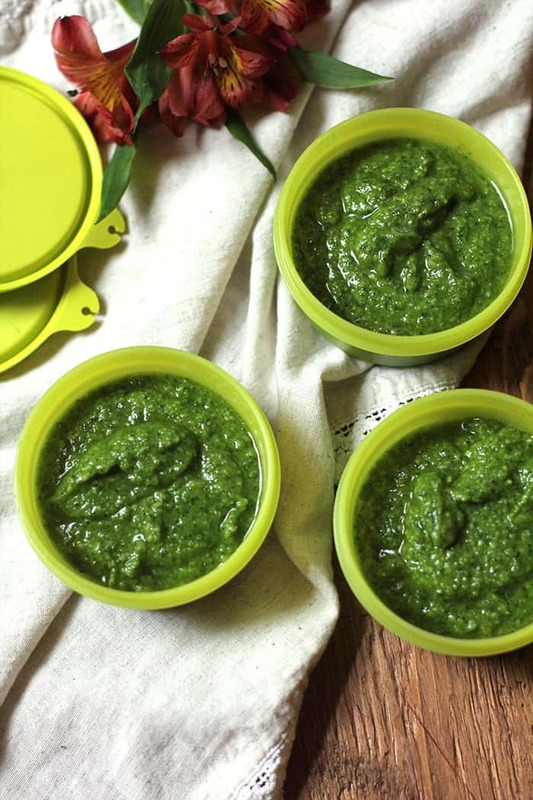 Freeze small portions of pesto sauce for a rainy day. The photo below shows how I freeze small amounts of pesto sauce for a rainy day. There is just over 1/2 cup of sauce in each container, and it freezes beautifully. I use the sauce in a variety of dishes, including 1) shrimp, 2) chicken, 3) roasted sandwiches, and pizza. Rarely do I need more than one container per recipe, so having it on hand is super convenient. 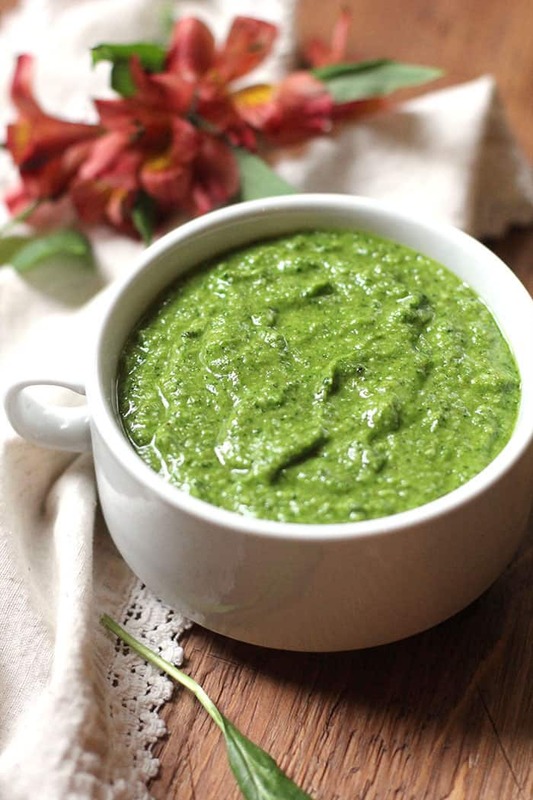 Using pesto really enhances the flavor of so many recipes. You can’t go wrong using it, and you will impress everyone at the dinner table. 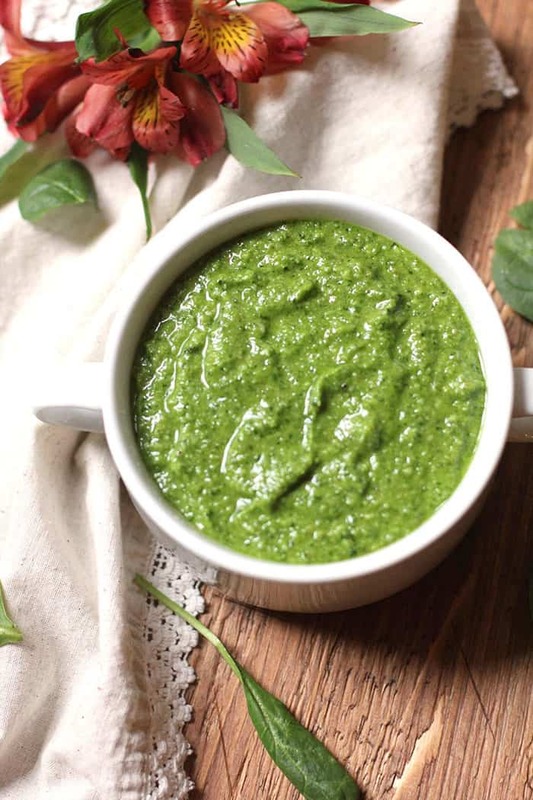 An easy pesto sauce, combining spinach, roasted walnuts, parmesan cheese, garlic, and olive oil. In a food processor, combine the spinach leaves, parmesan cheese, toasted walnuts, garlic, and salt and pepper. Pulse until course crumbs form. Add olive oil gradually, and pulse until smooth. Use in a variety of dishes (see blog post), or freeze in small portions. Whoaza! 5 ingredients and incredible taste! Put me in coach! Love it.